This may surprise some people but I had never made my own mayonnaise before. I wasn’t scared or put off by tales of splitting, I just hadn’t got around to it. So I waited specifically for when I wanted some mayonnaise and didn’t have any conceivable alternatives in the fridge. I used one beater on my trusty electric hand mixer and the cup for my stick blender. The trick is to not add the oil too quickly at first, I read in Rosemary Shrager’s Absolutely Foolproof Home Cooking that you should dip a spoon into the oil and let drops drip onto the eggs as you beat. Her mayonnaise recipes use 2 egg yolks and much more oil than I found necessary so my version ended up somewhat different to the one in the book. Also I used rapeseed oil because I hadn’t got enough non extra-virgin olive oil in the house. I didn’t want to waste extra virgin in mayonnaise as it would taste too strong. 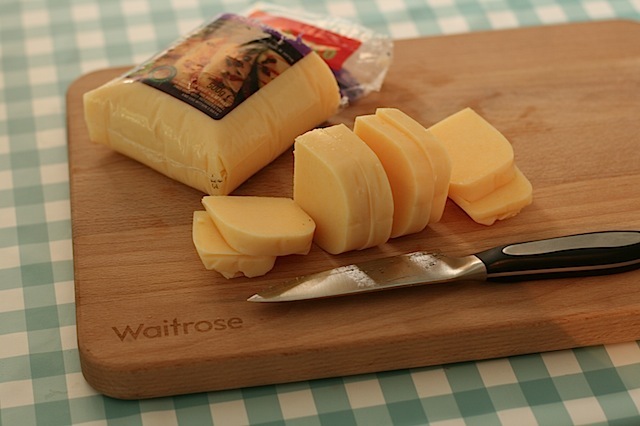 The bonus using rapeseed oil is the attractive golden colour – it looks more like a Hollandaise. Beat the egg yolk and mustard with an electric hand mixer, dribble oil into the egg mix by dripping it from a spoon at first. As the mayonnaise starts to bulk out you can add the oil more quickly, eventually pouring. Add the dill and then the lemon juice and salt to taste. 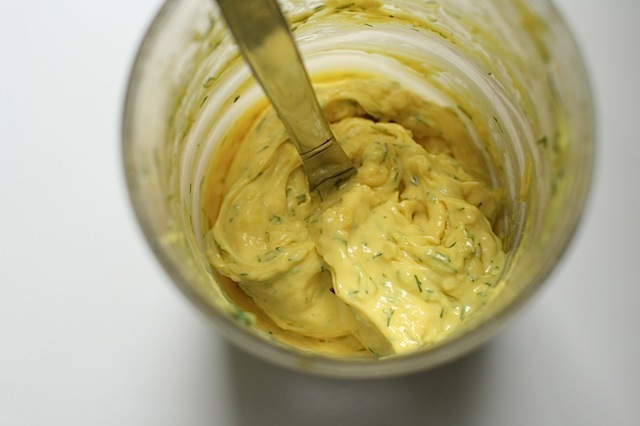 The mayonnaise will keep for up to 5 days in the fridge, stir it before using if it separates slightly. This mayonnaise pairs beautifully with smoked salmon. Food with stripes is always more fun with my @lecreusetUK a reliable means to scorch stripes into steaks, peppers and today, courgettes. 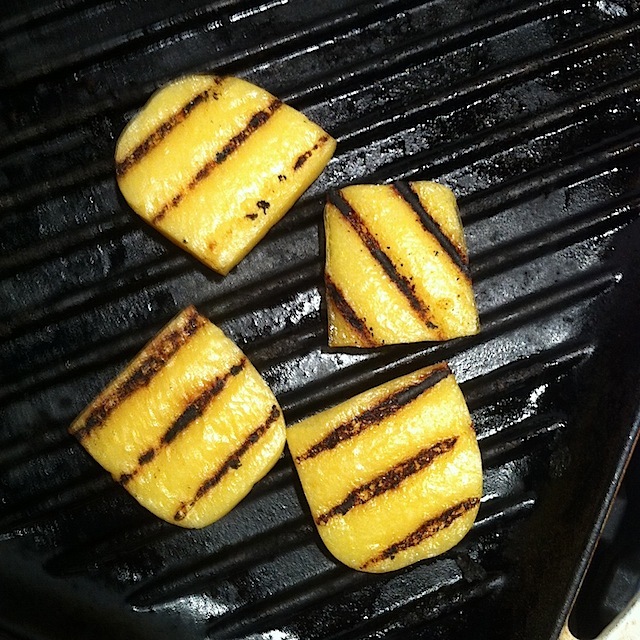 Yes it takes some time, yes it takes some babysitting but honestly the flavour from chargrilled courgettes cannot be matched by cooking them any other way. 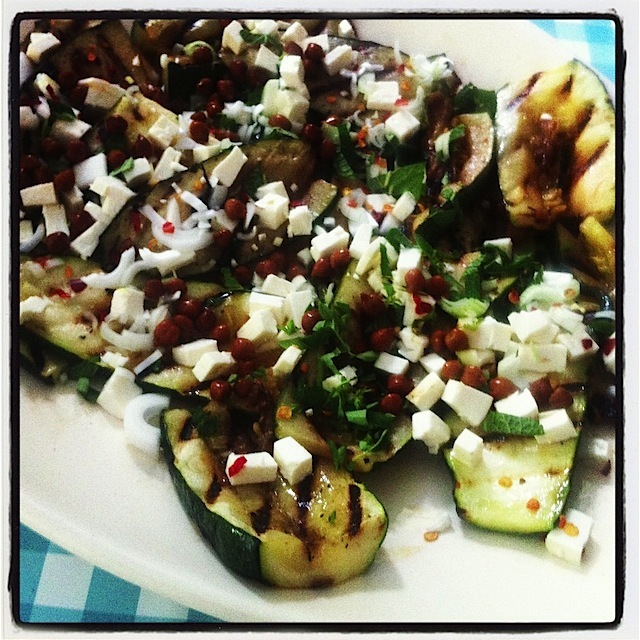 I once bought some ready made chargrilled courgettes in olive oil from the orange supermarket and they were ok but home made is way better. Confession: I received my Le Creuset grill pan as a wedding gift nearly 9 years ago and don’t use it as often as I ought. Delia didn’t invent them but I always associate piedmont peppers with her Summer Collection. 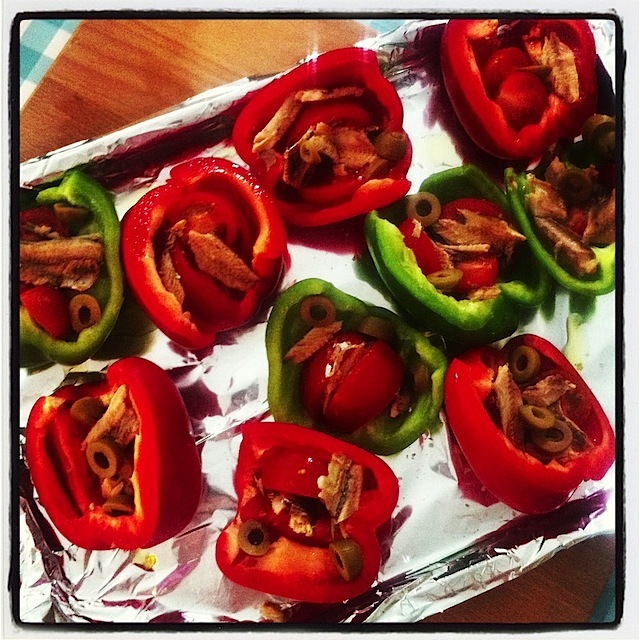 They’re almost a serving suggestion rather than a recipe – roast peppers filled with tomato, olive and anchovy. Usually my anchovies are artfully criss crossed fillets, these ones today were crumbled chunks of Belle Ile whole anchovies from one of their outlets in Brittany. I make them now without referring to Delia so I can’t guarantee I’ve actually stuck to the recipe. It’s just one of those things I’ve read in a book once and carried on making from memory ever since. Do you have any recipes like that? We had potatoes left over from a potato salad I’ve not blogged yet and it was time for Ted’s tea. 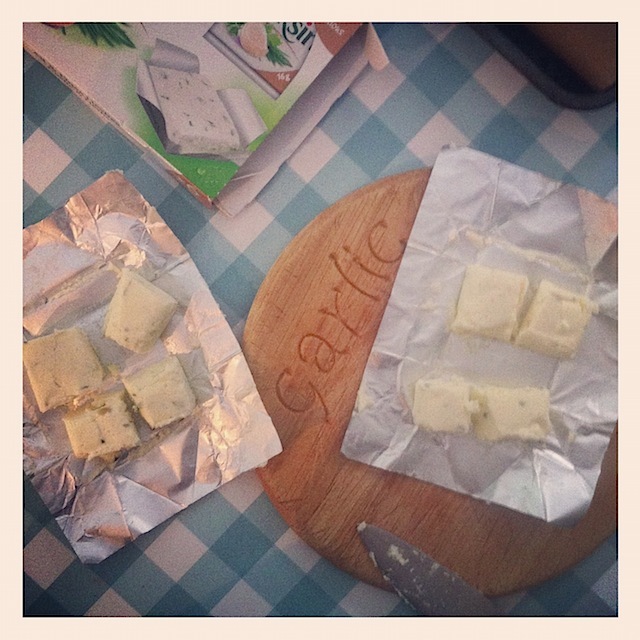 For a speedy supper for one six year old I fried left over potato slices in butter and when they were nice and crispy I added two beaten eggs and some cubes of Boursin garlic and herb soft cheese from these new dinky packs. 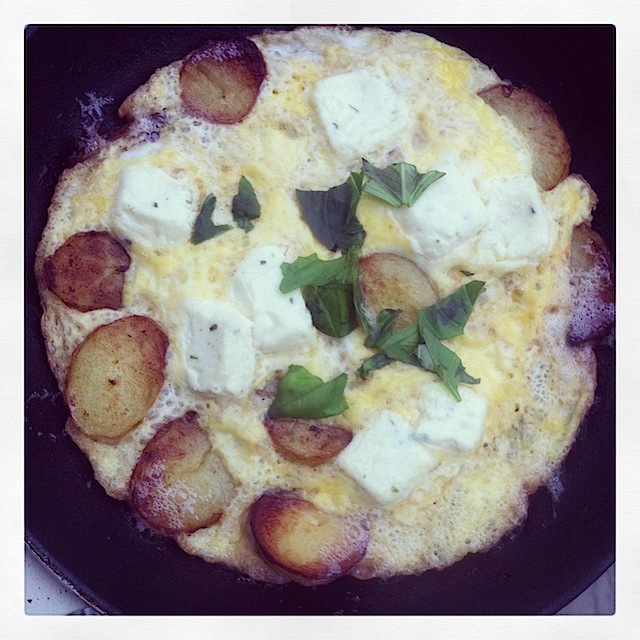 Top with some fresh basil and it’s rather fine dining for a six year old, I hope he appreciated it! Best of all, it was a bit big for a tiny tummy so I enjoyed a snack at the same time too. With thanks to Boursin for sample cheese. Last month I visited Venice for my 40th birthday and one of the things I was eager to try was cichette style appetisers in a Venetian bar. I will publish a Maison Cupcake post with the various Venetian dishes we tried but here is something I reproduced myself at home having been inspired during our trip. 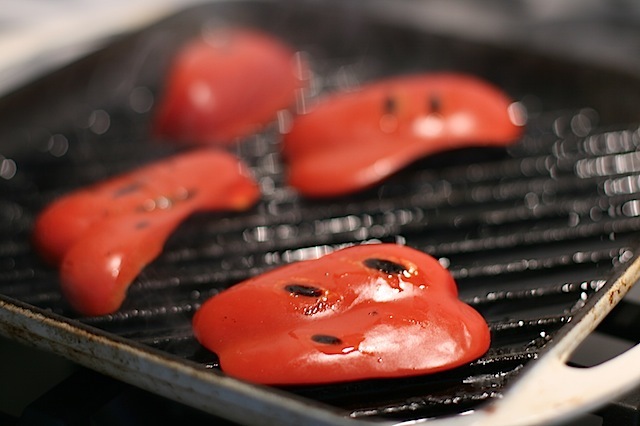 Chargrill some red peppers – I am using my Le Creuset griddle pan which was also used in the courgette salad I published on Tumblr recently. Now honestly, I did try to buy real polenta. But actually I could only get hold of a ready made block. Venetian white polenta would have been hard enough to find but I didn’t expect to struggle finding yellow polenta in a gigantic branch of Sainsbury’s. So ready made we have. It slices up and carries tiger stripes extremely well and it tastes good too. Although admittedly you can’t soup it up with parmesan like you would if you made it from scratch. 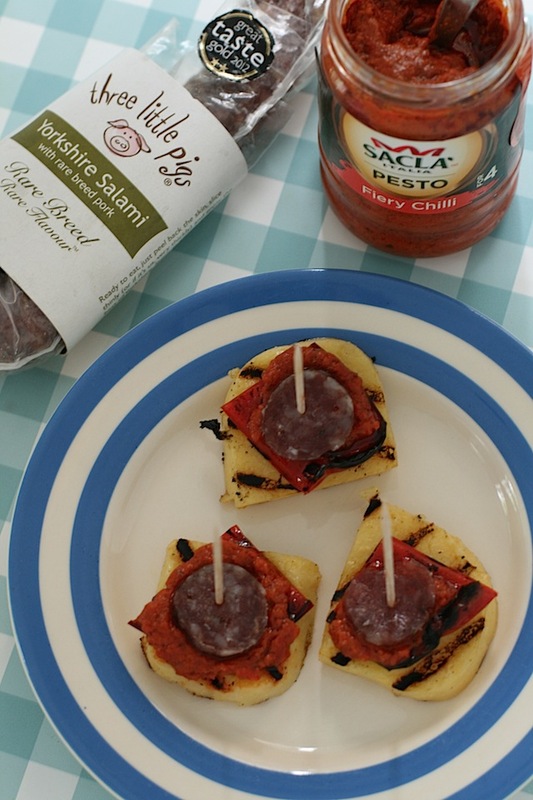 To fire up my red chargrilled pepper I am using Fiery Chilli Sacla pesto which as you can see is one of numerous flavours – I have already instagrammed the wild garlic one in some stuffed mushrooms and there’s a tart post in the pipeline for Maison Cupcake using the classic basil. This fiery chilli pesto packs a punch. I was rather taken aback how strong it was and it beefed up the Three Little Pigs salami beautifully. 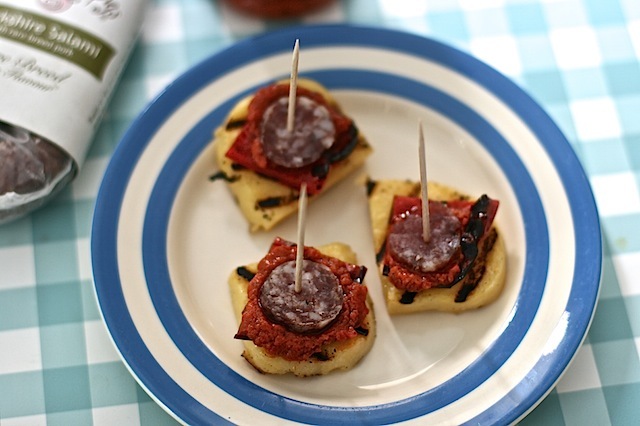 To assemble the cichette simply stack polenta squares, pepper, a teaspoon of chilli pesto and a disc of salami and fix together with a cocktail stick. I could almost be in the backstreets of Fundamente Nove. I had a trio of these cichette for lunch and when Ted saw the pictures he wanted them too. So my six year old had cichette for supper. Next he’ll be begging me to take him to Venice but that can wait. Had you ever come across cichette? 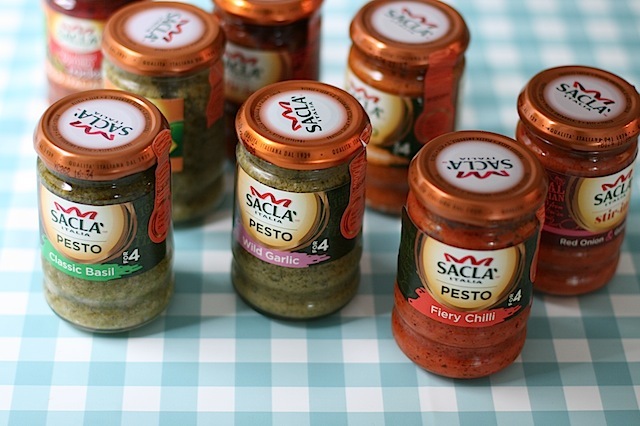 With thanks to Three Little Pigs and Sacla for sample products.